Red 4x4 SCRAMBULANCE AMBULANCE. CFW77. MBX Heroic Rescue. New in Blister Pack. 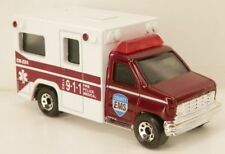 Ford E-350 Red AMBULANCE Unit #85 Emergency DVK87. 77/125 MBX 2017 New SEALED! Cool Matchbox car as pictured. Actual Scale can vary. Very good condition. AS SOON AS I AM ABLE TO DO SO. I MAY NOT BE AWARE OF THE TYPE OF. 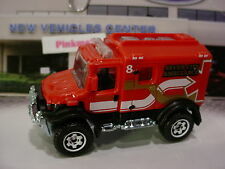 2019 Matchbox #41 MBX Rescue INTERNATIONAL TERRASTAR Ambulance New HTF 👍. Condition is New. Shipped with USPS First Class Package. Uniq ue set and a great additions to your colle ction. Volvo Ambulance Bus. News Utility. (but I do tend to be accurate). 2018 MATCHBOX POWER GRABS -8/20 MBX SERVICE. AUSTIN MINI VAN - brown. NEW in SEALED BOX. Item is in great condition and still in the original bag. Great item to add to a collection. It will be. 25 for each loose item and. 50 for each carded item. This is red "Miller County" version with white and gold accents. (Super SHARP! die cast 1/64th scale Matchbox version of the 1963 Cadillac Ambulance. CLASSIC early 60's Cadillac style! Don't wait!). (They won't have this! ONE OF A KIND!). The car shows minor points of wear. J Team Collectibles. Sincerely. 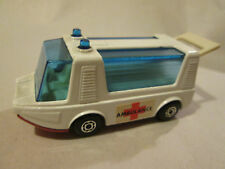 Item for sale : 1971 Matchbox Stretcha Fetcha Ambulance Van MB-46 England. Made in England by Matchbox 1971. Sold as shown in photos above. Fast replies! BECAUSE ITS CHEAPER. Unique set and a great set to add to your collection. The cars have been taken out of their boxes and displayed in cases all its lives. INTERNATIONAL TERRASTAR AMBULANCE. SE HABLA ESPAÑOL. Original 1960's Matchbox wheels (good) and axles (axles are straight, car rolls). Hard-to-find collectible condition - no box. Interior is in good condition. Made in China by Matchbox 1977 Base. Sold as shown in photos above. Die-cast Car - 1:64 Scale. Made in Macau by Matchbox 1977 Base. Sold as shown in photos above. Die-cast Car - 1:64 Scale. Lot of 8 Vintage Matchbox Lesney Cars Planes Rare Diecast metal . Condition is Used. Shipped with USPS First Class Package. YOU ARE LOOKING At A 2015 Matchbox Exclusive Renault Master Ambulance. This Truck In In Mint Condition. CHECKING OUT WITHOUT THE CORRECT TOTAL WILL NOT GET IT TO YOU ANY FASTER. This one features classic white glossy finish with colored panels and details! There are classic Rescue / EMT type decals/ logos as well. (They won't have this! ONE OF A KIND!). I may have just what you want, and can customize it just for you! '63 CADILLAC AMBULANCE. 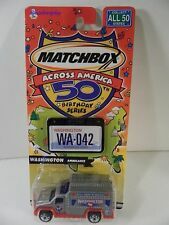 2009 MATCHBOX. BOXES, NOT ENVELOPES, TO KEEP YOUR ITEM PROTECTED. Land Rover DEFENDER 110 Best of Matchbox DKC65 Ambulance NEW in blister pack! Item is in excellent condtion with mild paint and play wear as pictured. Faint scuff on windshield as pictured. Top lights are secure in their housing. Rear doors open and close as they should and are secure on hinges. Very mild wear on stickers as pictured. Rolls straight. CONUS shipping only. Thanks for looking and play nice. #63 Ford Ambulance, poor, decals gone, major wear. Matchbox Military lot. #61 Ferret Scout Car, fair, play wear, no driver. #61 Ferret Scout Car, fair, play wear, a bit of corrosion, dirty with clay, has driver. MBX RESCUE. ALL OTHER COUNTRIES. Don't let these slip away! Specially designed for the adult collector. Top right corner of plastic is sliced. 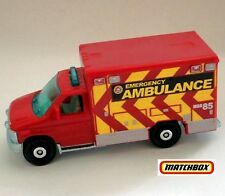 Matchbox '63 Cadillac Ambulance white 2009 #55. Condition is New. Shipped with USPS First Class Package (2 to 3 business days). ONE OF THE REA PLASTIC DOORS IS MISSING. MORE VALUABLE CARS WILL BE WRAPPED IN BUBBLE WRAP AND PLACED IN A DURABLE HARD PLASTIC CASE.